A divine place of nature "Kalpa"
Situated at the height of 2758 m above the sea level and 110 km from Sarahan, Kalpa is a beautiful and main village of Kinnaur. Across the river faces the majestic mountains of the Kinner Kailash range. These are spectacular sights early in the morning as the rising sun touches the snowy peaks with crimson and golden light. When you arrive at our hotel in kalpa, our hotel staff can describe you complete history of kinnaur and for the customer satisfaction our all hotels packages covered complete kinnaur including kalpa, rakcham, sangla valley. ACCESS : Nearest Airport (267 km) and Railhead (244 km) is at Shimla. The route is on NH - 22 (The Hindustan Tibet Road) which bifurcates to Kalpa from Powari. Buses and Taxis are available at Shimla and Rampur. One can also reach Kalpa via Manali - Rohtang Pass - Kunzam Pass - Kaza (400 km). CLIMATE : In winter, the temperature can drop to below freezing point (at kalpa / Rakcham both) when heavy woolens are required and for summers light woolens are recommended. RIBA (2745M) : Just 18 km from Powari on NH-22 is famous for its vineyards and local wine 'Angoori' made from grapes. Kinnaur - the land of fairy tales and fantasies, has a spectacular terrain of lush green valley, orchards, vineyards, snow clad peaks and cold desert mountains. It is a border district of Himachal Pradesh. Kinnaur is also rich in flora & fauna. The culture and language is different from other parts of the state. Kinnaur, the tribal district of Himachal Pradesh, lies 250 km away from Shimla, the capital of Himachal Pradesh and is situated on the NH - 22 (Hindustan Tibet Road). The landscape of the area varies from lush green orchards of the scenic Sangla Valley to the stark magnificence of the Hangrang Valley. 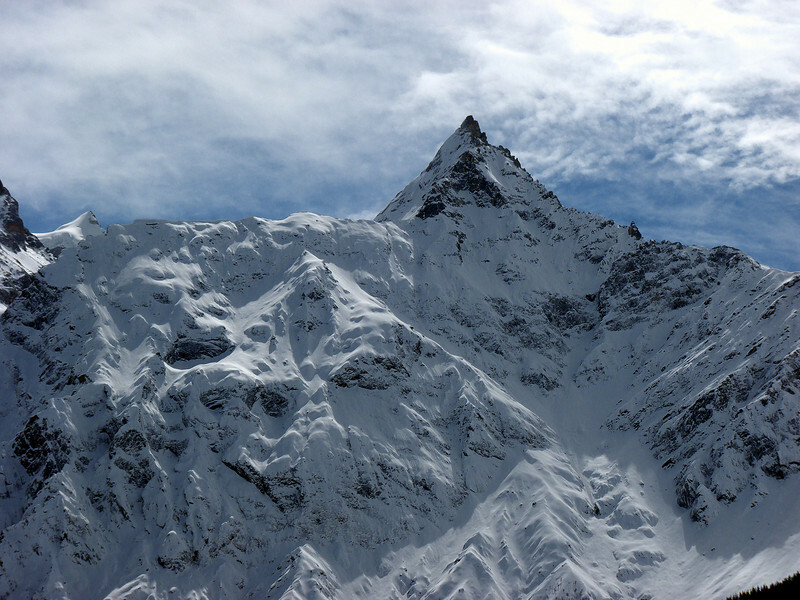 The massive snow clad ranges that provide a regal dignity to the scene are dominated by the peak of Kinner Kailash. Kalpa is one of the biggest and beautiful villages of Kinnaur. One can enter Kinnaur district at Village Chshora and follow a straight line road constructed in vertical rock and it is a rare treat to travel on this road which is a great engineering feat. Guests are most welcome to talk to us and discuss about various places in and around Kalpa or kinnaur. Any kind of suggestions or help they need from us regarding Shopping, Health check ups, etc, we are always there.